Since the Fukushima disaster LNG has been a seller’s market. This balance has undergone a sharp transformation in 2014. The summer slump in LNG spot prices sent shock waves through the global gas market. After a Q3 recovery spot prices have slumped again despite winter approaching. This is suggesting a structural rather than a seasonal oversupply of gas is looming. Since the Fukushima disaster, LNG has been a seller’s market. But the LNG market balance has undergone a sharp transformation in 2014. The summer slump in LNG spot prices sent shock waves through the global gas market. All eyes have been on the approaching winter as a barometer of the LNG supply/demand balance. But after a Q3 recovery, spot prices have slumped again over the last few weeks, falling below 10 $/mmbtu. This is suggesting a structural rather than a seasonal oversupply of gas is looming. 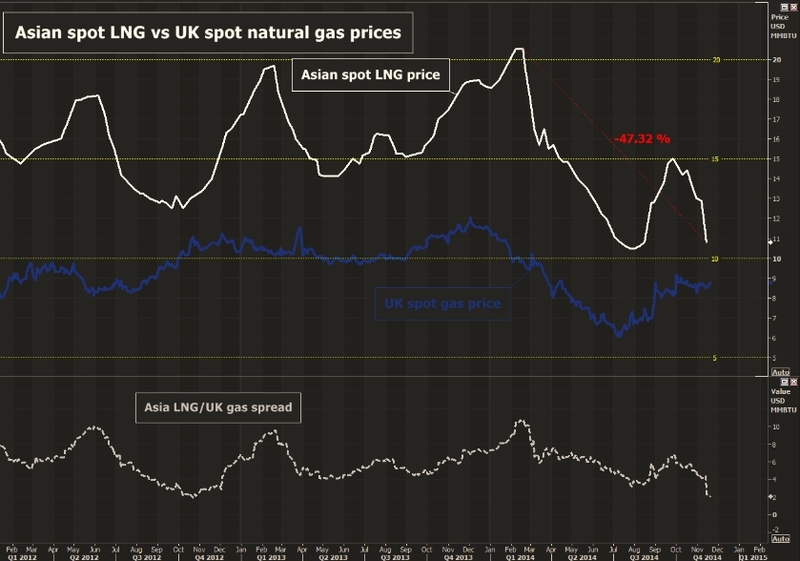 Chart 1 courtesy of the team at Reuters, shows Asian spot LNG vs UK NBP prices. There was a sharp Q3 Asian LNG spot price recovery from summer lows of around 10 $/mmbtu. But the recovery into winter has proved short lived. Over the last six weeks spot prices have plunged from above 14 $/mmbtu to break through the summer lows to levels below 10 $/mmbtu towards the end of last week. The Asian market looks to be well supplied into the coming winter. Temperatures have been mild to date and there has been a notable absence of the strong incremental hedging volumes that have been common in Q4 over recent years. In fact there has been very little interest from large Japanese and Korean buyers as prices have slumped, given they are already well supplied via long term contract volumes. In addition the LNG spot market faces an overhang of ‘floating storage’ volumes. Portfolio players bought spot cargoes during the summer price slump with a view to selling into higher winter prices. This has proved to be a painful strategy and the overhang is contributing to downward price pressure. LNG market players are also aware of the impact that the recent spot crude price slump will soon have in pulling down long term LNG contract prices. The majority of Asian LNG contract volumes are indexed to the JCC Japanese crude marker, typically with a several month time lag. This will mean a strong downward pressure on long term contract prices into the spring of 2015. And it will likely cap any recovery of LNG spot prices even if demand picks up over winter, as buyers have the ability to call on contract flex in preference to entering the spot market. The Asian spot price slump reduces the risk around a tight winter in Europe. Concerns have been that a prolonged cold spell and Russian interruptions could cause very high and volatile hub prices across winter. The threat of large scale Russian interruptions to European supply this winter is unlikely anyway in our view. But if this did occur, or if there were more major infrastructure issues (a higher probability in our view), the UK is particularly vulnerable to a sharp increase in marginal import prices over a cold winter. The price spikes of Mar 2013 are an illustration of what happens when the UK NBP hub needs to price up to attract spot LNG cargoes. But weaker Asian spot LNG prices reduces this threat in two ways. Firstly, weak Asian prices will cut-off cargo diversion arbitrage plays from European supply contracts, meaning a higher flow of LNG into the NBP and TTF hubs, as well as the potential for higher volumes of Qatari LNG diverted to the UK. Secondly, if Europe (particularly the UK) does need to price up to attract additional LNG imports it is likely to be at much lower price levels than the last three winters. We wrote previously that we would be watching this winter closely as a barometer of transition in the global supply/demand balance. The renewed slump in spot LNG prices suggests the balance in the global gas market is shifting back towards the buyers.